50th anniversary of his passing. Grand Prix win ratio of 25 in 73 races. Astonishing statistic. The world's greatest ever driver? Fearless, but Macrae is the greatest driver ever. Greatest British F1 driver without a doubt. Was only 5 when he died but, I can remember my dad being devastated. Yep. Totally agree with that. Top five all time too. As for the greatest Scottish sportsman ever: with the conventional definition of sportsman, it's either Clark, Sir Chris Hoy, or Andy Murray. With my unconventional one (because I don't see how he's not a sportsman), it's Sir Alex Ferguson first, daylight second. MacRae couldn't touch Clark in terms of sheer genius. A man who once said in an interview that he never drove at 100%. Correct, 95% as 100% would be scary. Greatest Scottish sportsman? Eric Liddle for me. And yet he doesn't ever get a mention on any F1 program that I've ever seen. Can't argue with that, every time that generation got in the car they where risking everything, not quite the same now because he did. 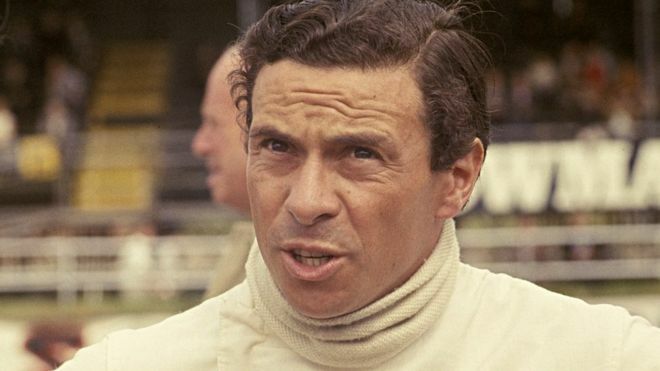 Jim Clark is a Scottish and world legend in F1 and sport in general. Went to his museum in Duns and had tears in my eyes watching videos of this great Scotsman. Couldn't believe a farmer from the borders became such an icon. As we all know the press and media are not great at representing Scottish achievements. True - but it's also because most of his achievements were in black and white, ie. too long ago for most to engage with. Both Great but Jackie has 3 World titles so he's not even Scotland's greatest F1 driver. As for scary, I'd rather be in an F1 car as a passenger, than a rally car. I was also very young when he passed away. He seemed to be a humble man. One story, I heard from an old woman whose parents ran a hotel in Duns and were friends with JC. She worked in the bar and JC was a regular visitor. He would pop in with other famous F1 people of that era and enjoy a meal in the restaurant. Often he would go through to the kitchen to talk to the staff and end up helping them out by washing or cleaning the dishes. Imagine that happening these days. Ayrton Senna said Clark was the best of the best. High praise indeed. Jim Clark also won the Indy 500. Jim Clark - 2 times F1 World Champion and Indy 500 winner - A Scottish Legend. 4 Indycar series and 1 Daytona. Must be up there for the best. Who has the most GP wins and points. DC? We've had some phenomenal racing drivers, and as someone said earlier we really don't celebrate our sportsman that well. Even Andy Murray. The Grand Tour did a segment on Friday about Jim Clark. Travesty what happened and a travesty that he is so little talked about. What an incredible man. The greatest ever. Remember visiting his museum as a laddie, actually it was a room in a house in Duns IIRC, this must have been around the mid '70's, and I can remember just being blown away by the sheer number of trophies/cups etc that there were. Really need to pay his museum a visit again. 'the grand tour' done a nice little tribute to him at the end of Fridays episode. I had no idea he was as successful as he was. Yeah was a really nice piece, must confess that even as a massive petrolhead myself, even I totally underestimated the sheer prolificacy of the man. His story is one which should be told on far bigger stages than it has. New museum in his honour opening in August in Dunns. Always considered Jim Clark the greatest sportsman to have ever been born in Scotland. Although not Scottish, but as other British drivers are being mentioned, I still find it surprising the lack of attention John Surtees gets. To be the world champion on both two and four wheels is easily something that will never happen again for as long as the universe exists. What more can be said on the subject. I moved out of Duns 10 or so years ago and the Jim Clark Room was still there. Always found it odd that it's in Duns, as he was actually from Chirnside. Born in Fife, at Kilmany. But the family moved to Edington, near Chirnside when he was 6. Definitely, that’s why quite a few of motor racing’s greats see him as the best. The Jim Clark rally would always start from in front of the museum. I’m not sure if it was situated there so the rally could start there, or the rally decided it should start there. Either way, it was a very fun few days in the town. If you look at his results, he very rarely ever came second or third. He was generally first or didn't finish due to mechanical reasons, or if lower placed was nursing a failing car to the finish. He rarely crashed out either. And that applies to all the types of racing he was involved in, be it Rallying, Saloon cars, F1, F2 or Indy. Apart from Eyemouth, Duns is the next big village in the area and its only a short drive to Chirnside from it. Senna visited the Jim Clark room and bought all the Jim Clark pencils. Never knew that. Senna is god for me, so what does that make Clark, when Senna says Clark is above him??? Senna got a painting of the grid in Monaco painted by some Mexican painter. Senna had 2 stipulations. 1. Alain Prost wasn't to be in the painting and 2. Jim Clark was to be on pole because he was the best of the best. I would have stipulated number 1 as well. Jim Clark The quiet champion. YouTube. I am not a petrolhead nor F1 fan - my knowledge of cars isnt much. Watch TP and TGT more for the entertainment value. However, TGTs section on Jim Clark brought a lump to my throat and I was blown away by his success. Even the effort of driving over 60 races in a year is phenomenal. My son and I will visit the new museum when it opens. His Indy500 drives were astonishing. The man was brilliant.